Add leaves to your project or quilt with our leaf applique patterns. There are 5 different leaves in 4 different pattern sizes so you can add our appliques to a variety of autumn leaf projects. Bonus: The Easy Print Version contains all 5 leaf applique patterns and each leaf comes in 4 sizes. © Copyright 2015 by AOK Corral Craft and Gift Bazaar All rights reserved. Fusible adhesive such as "Heat’n Bond"
and Lg 5.00" x 6.50"
and Lg 4.75" x 6.00"
and Lg 5.50" x 5.25"
and Lg 5.00" x 6.25"
and Lg 7.00" x 6.25"
Note: Be sure to use the right fusible adhesive for your project. If you plan to stitch the edges of your appliqué, you should use a light fusible adhesive. If you do not want to stitch the edges of your appliqué and you want it to be washable, then you should use an ultra strong hold fusible adhesive. Look for fusible adhesives in your fabric store near the interfacing. Cut out the pattern for the size of leaf that you wish to appliqué. Lay your fusible iron-on adhesive out with the paper side up. Trace the pattern onto the paper. Cut the extra fusible adhesive paper around the traced pattern about 1/2 inch away from the pattern lines. Lay the adhesive, paper side up onto the wrong side of your fabric. Follow manufacturer’s instructions for bonding the adhesive with your iron. Cut out the leaf pattern through both the fabric and paper, and then peel off the paper backing. Follow the manufacturer’s directions to apply the appliqué. The PDF version (available below) contains patterns for all 5 leaves in 4 sizes each! 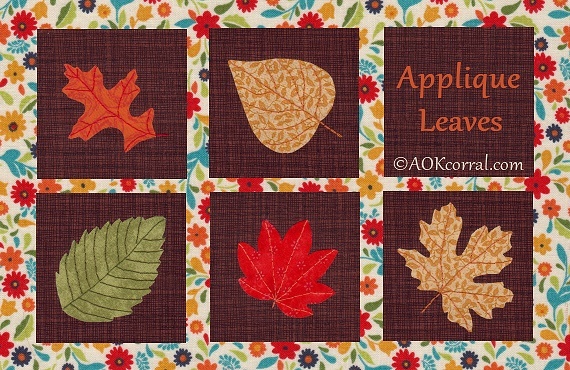 Use these leaf patterns to applique or embroider onto quilts, linens, clothing and more. Great for fall season projects! © Copyright 2015 by AOK Corral Craft and Gift Bazaar. All rights reserved. *This version includes 5 leaf applique patterns and each leaf comes in 4 sizes.